May was such a busy month for all of us, I bet it was for you, too. After this month's party we'll be taking a break from BOTN for the summer. We'll be back in September, though, with a fresh new spin on the party! Obviously, my "best" this month was my new bedroom! 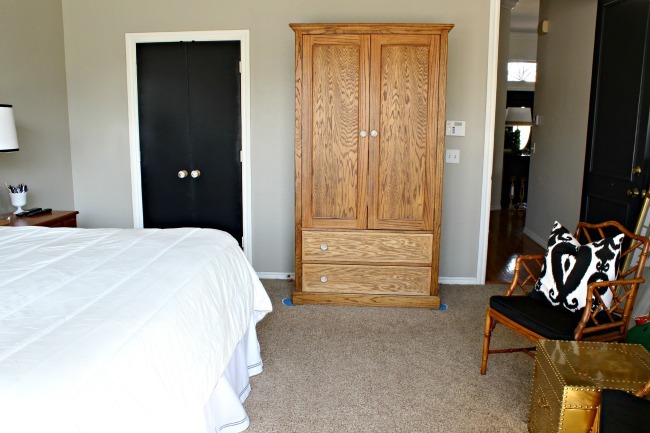 Although, I had several projects with the bedroom makeover that were runners-up, too. 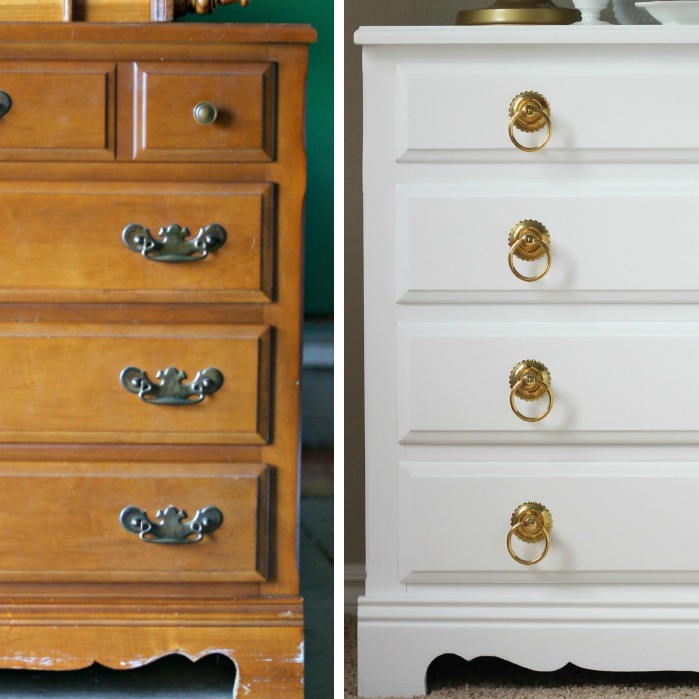 This nightstand makeover is probably an all-time favorite. 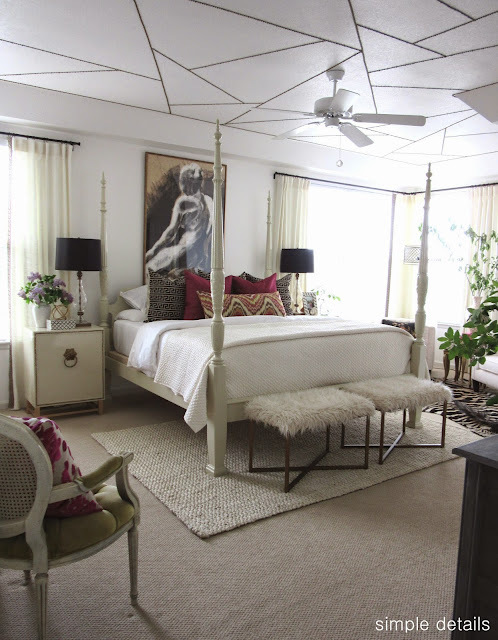 Pam created a bedroom fit for the pages of a magazine for her client during the One Room Challenge. 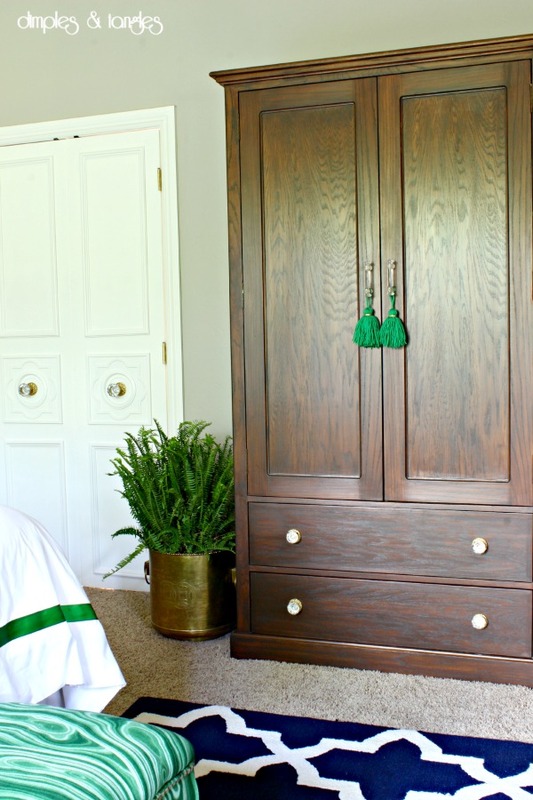 Packed full of diy projects and Craigslist finds, Pam once again proves that stylish design can be done on a budget! 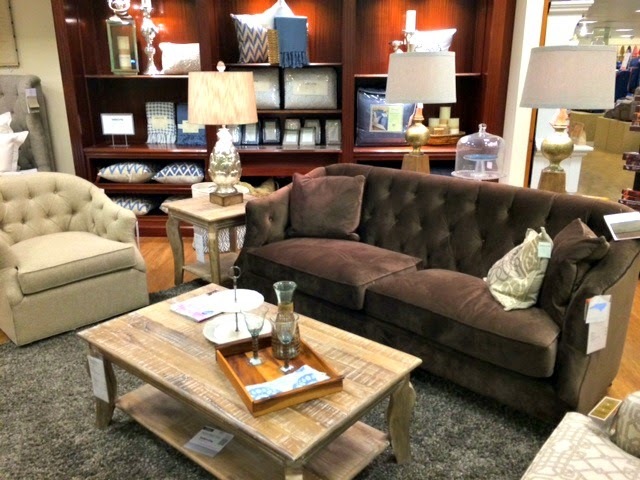 Lisa took part in the ORC also, making over a client's family room. 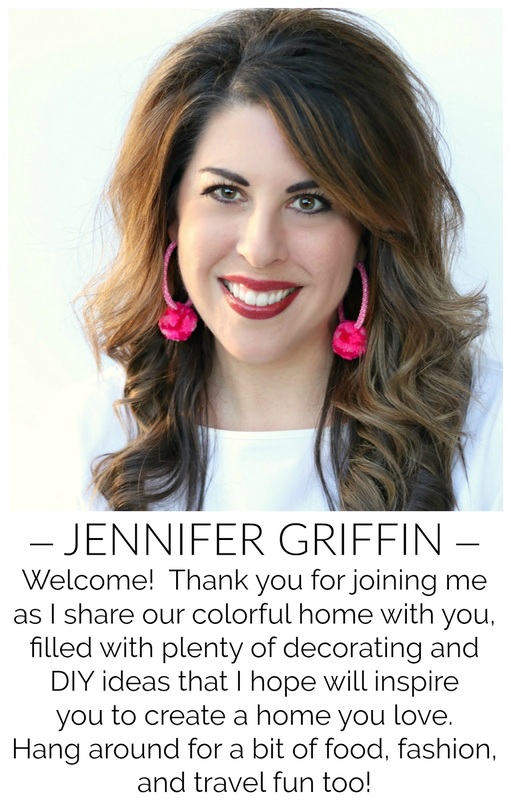 She did a beautiful job of blending what the family already had and wanted to keep with a few new key pieces to update the space. 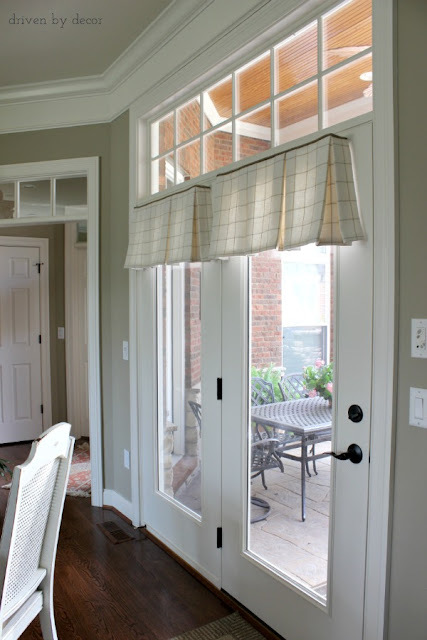 Finally, Kris shared a tour of a variety of window treatments in her parents' home that are wonderful examples of what to do for tricky windows. I love all of the unique options! Alright, let's see what you've been up to! 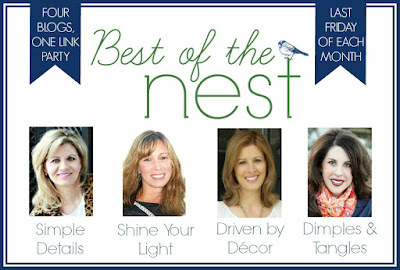 And don't forget, even if you aren't a blogger you can still participate. Just post a photo on Instagram and be sure to tag at least one of the hosts and use the hashtag #bestofthenestparty. *Please make sure that your project is from MAY. For my recent bedroom makeover, I knew I wanted to do something special with the doors that lead to the Master Bath. A few years ago I painted them black, but that paint job was actually not a very good one, and I was ready to take them back to white anyway with the direction the room was headed. 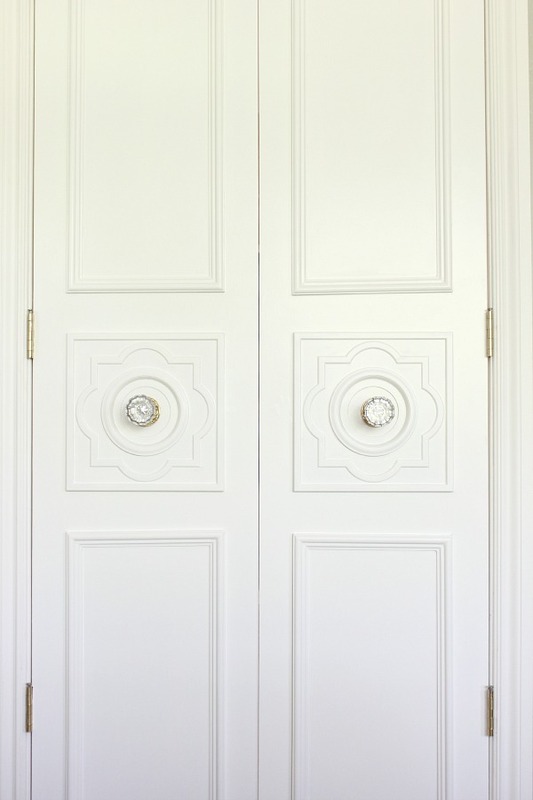 With some previous experience adding moulding to our previously flat kitchen pantry doors, I knew that moulding would give these doors a much more custom look as well. 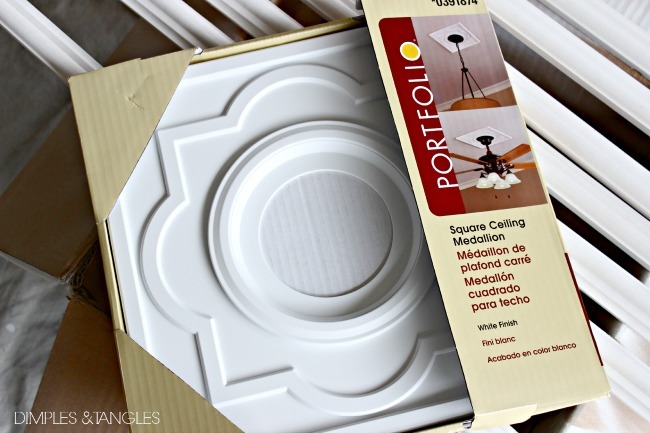 Since the armoire, door frames, and rectangular headboard were giving lots of squared off edges in the room, I really wanted to add some rounded shapes to break up all of the squares. 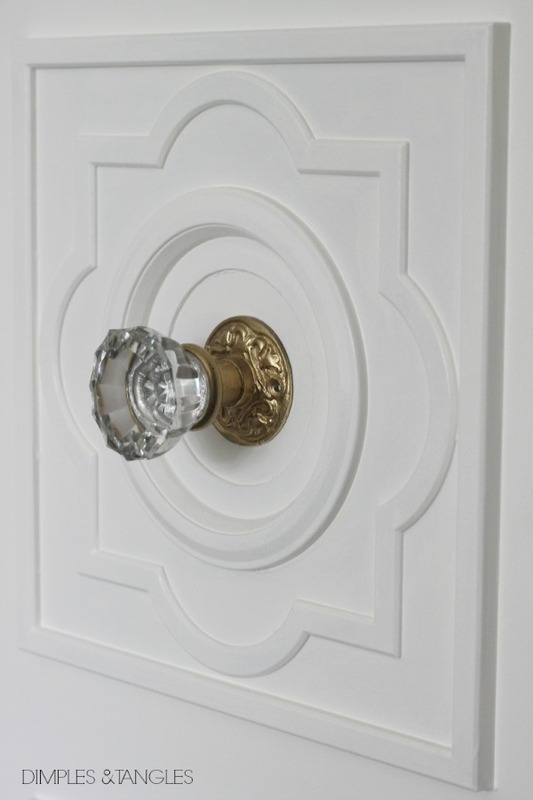 I envisioned running to the moulding store to pick up some curved moulding so I could do something like this, but come to find out the company that made that moulding for so many years doesn't anymore. I may have had some options for something similar by shopping online, but of course I was down to the wire and didn't have time to wait for supplies to be sent. So, I set off down the aisles of the hardware store to try to find some options. I thought I might be able to find some thin trim that was flexible enough to bend into the shape I wanted, but no luck. 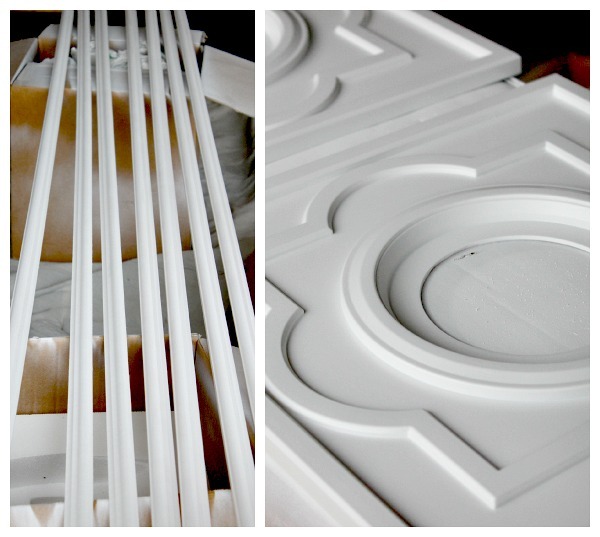 Then, I thought of the round ceiling medallions that I knew had an edge similar to the other trim I was using. I thought I might just trim the edge off with an exacto knife and use just the curved edges along with the straight moulding I already had for the doors. While considering the choices of medallions, I came across several smaller options that I hadn't seen before. This one was one of those, and I was immediately drawn to it because it had some circular lines that I wanted, and it was just the right proportion for the width of the doors. I brought home a few options, and ultimately decided that these from Lowe's would be best rather than trying to make something else work. 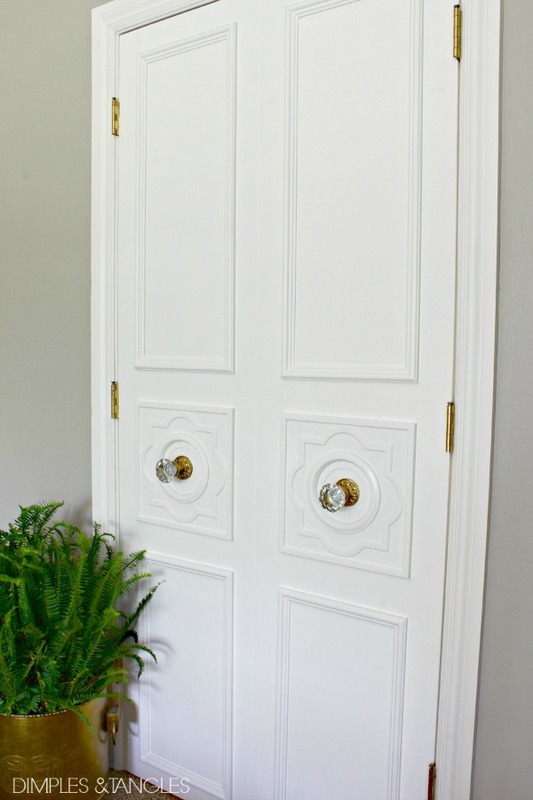 After deciding on a design for the entire door, I used spray primer on the bare wood moulding and the plastic medallions so that my brushed on paint would adhere properly. 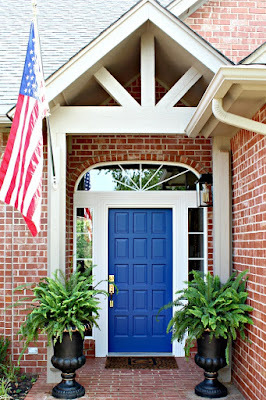 I started by placing the medallions on the doors first. I just placed them at the same height that the door knob was previously, even though I was moving the knob to the center of the door. 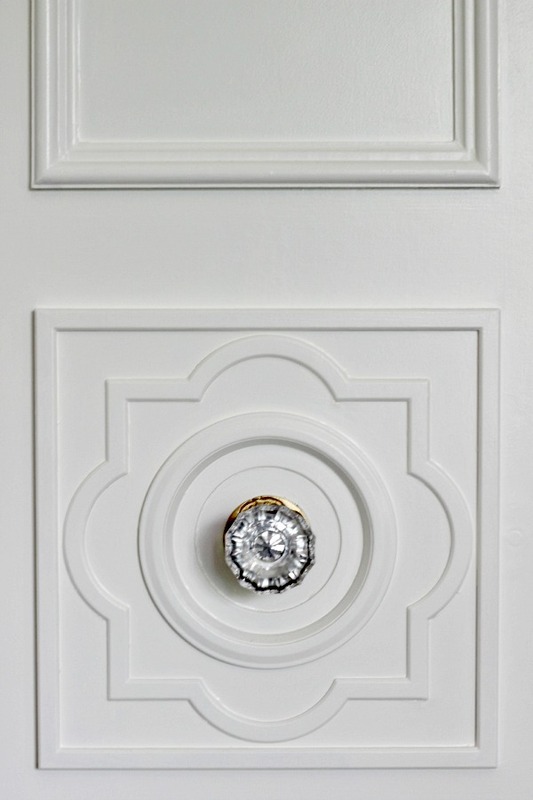 To attach them to the door, I used Gorilla Glue on the middle circular section of the medallion. That was the greatest area that was flush against the door, and the best option for bonding well. 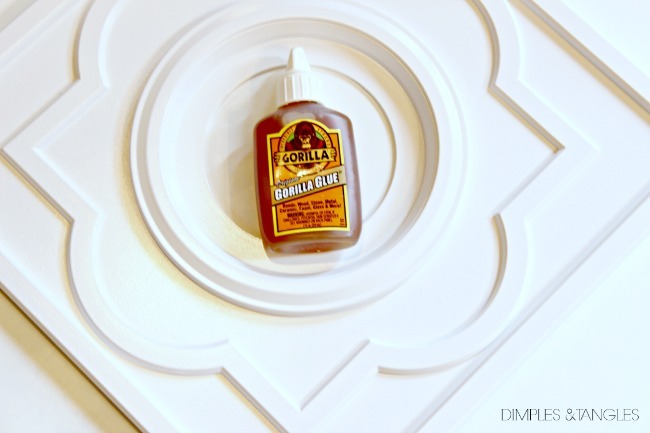 I love Gorilla Glue. 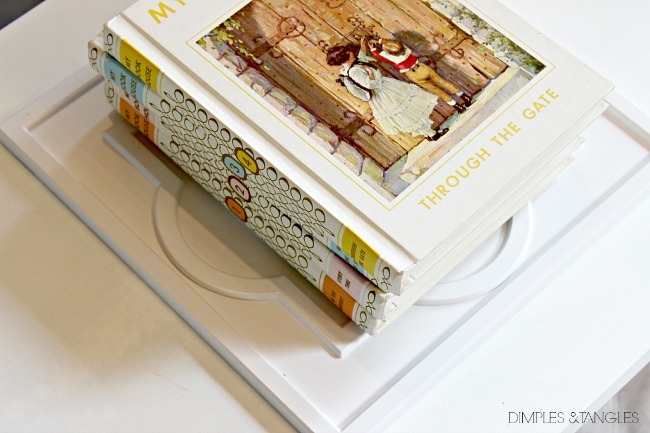 The instructions are easy to follow and the hold is superb. It expands as it dries, so although I did have a bit that leaked out, I was able to chip that off with the tip of a knife. 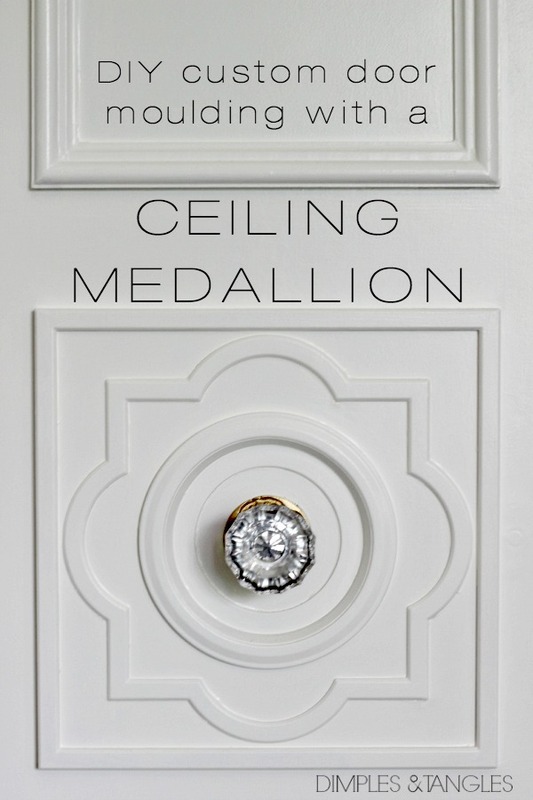 I debated caulking around the outside edges of the medallion, but it is tight enough against the door that it really wasn't necessary. Then, after lots of measuring, I made the necessary miter cuts on all of my straight trim to make the rectangular boxes on the top and bottom of the doors. 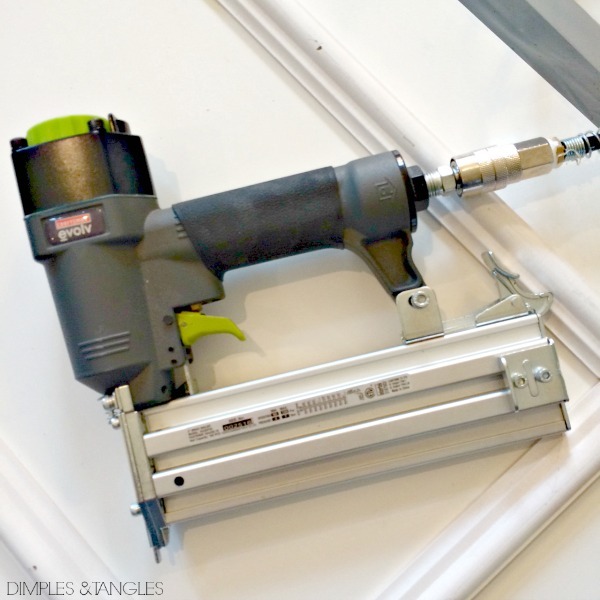 We have a basic miter saw similar to this one that is a lifesaver. Trust me, with 64 cuts to make, it's a tool well worth having (I've used it many many times for light duty jobs that require a saw, as well). For this project I also got to finally put this year's Christmas present to use. My husband got me this air compressor with brad nailer... again, another lifesaver for this project! It worked perfectly, wasn't too terribly loud, and really helped speed things along as I attached all of the moulding strips to the door. After all of the moulding was attached, I filled in the nail holes, sanded well when that dried, and painted everything. I used a color custom matched to the trim in the house in semi-gloss, and a combination of a brush and foam roller. The crystal knobs we had (from Ross a few years ago) are stationary like dummy knobs, but they still have a post that goes all the way through the door and connects to a knob on the other side. So, since I didn't want the inside of the doors to look strange with a knob by itself right in the middle of the door, I went ahead and did all of the trim and medallions on the inside of the doors, too. 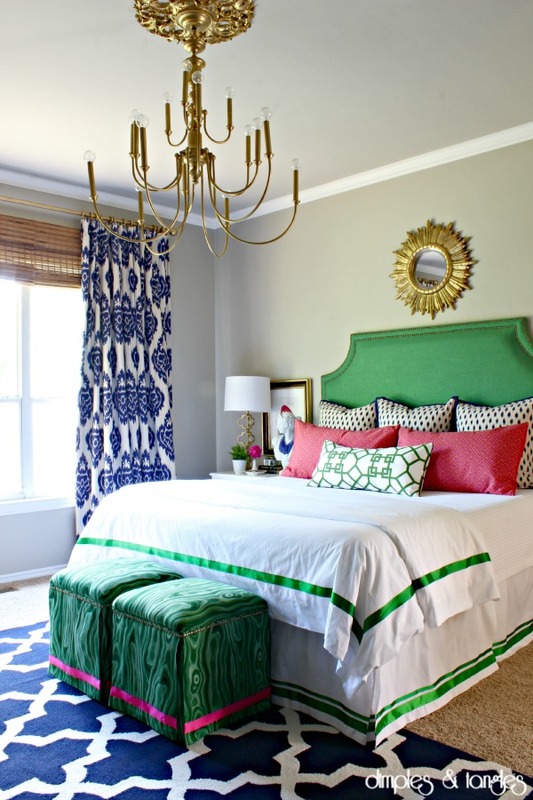 I really like that even when the doors are open into the bedroom, the pretty details can still be seen on either side. How about a good before and after? This project probably took a couple of days off and on, a little over $100 for the moulding, 4 medallions, and paint, but I think the results are so worth it. 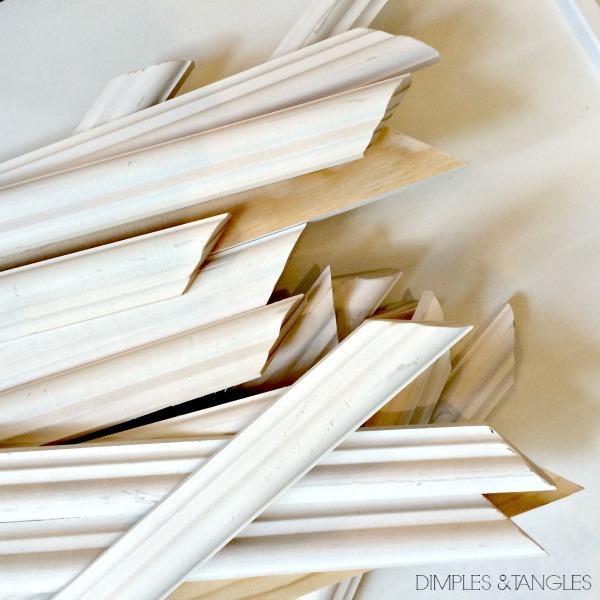 Adding moulding is really a pretty basic DIY project, I think measuring correctly is the trickiest part! Hey friends! I hope you all had a wonderful holiday weekend. It was a soggy one here, and we didn't really have big plans or go anywhere special. We got a lot of chores and projects done around the house (some to show you soon! ), celebrated my Mom's birthday, and sent the kids and their cousins home with my parents for a big sleepover. So, Ray and I enjoyed the day together yesterday just poking around the house and watching Netflix. 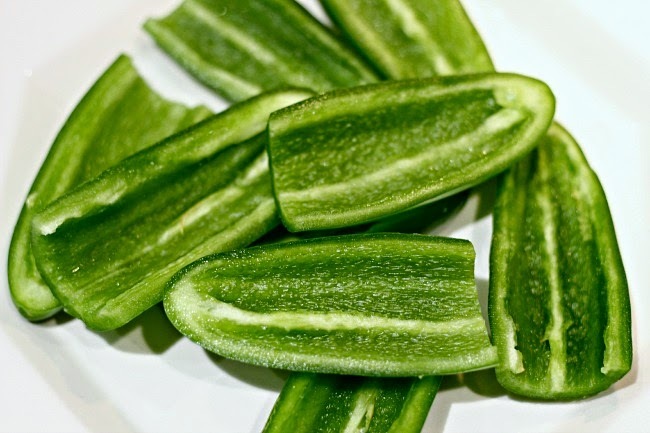 After removing the tops, slice the peppers in half length wise, then scoop out the veins and seeds. I have a little grapefruit spoon that's serrated on the end, and it works perfectly for this. By the way, you might want to wear gloves when working with the peppers. If I'm making a small amount I usually don't, but I made about 60 of these at Christmas and a few hours later my skin was really burning from handling the peppers. 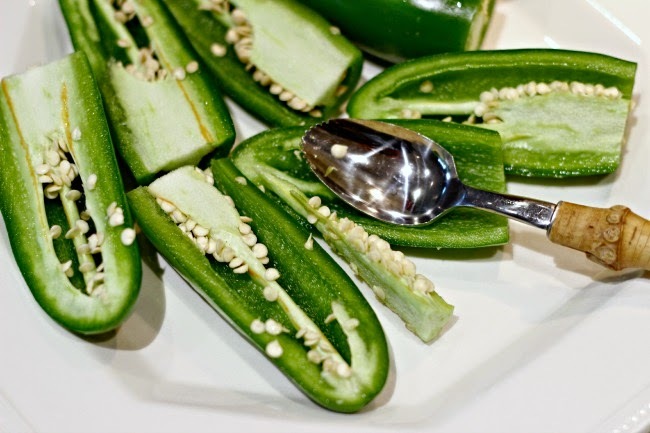 If you happen to get a pepper burn, pouring rubbing alcohol over your hands helps soothe the sting. 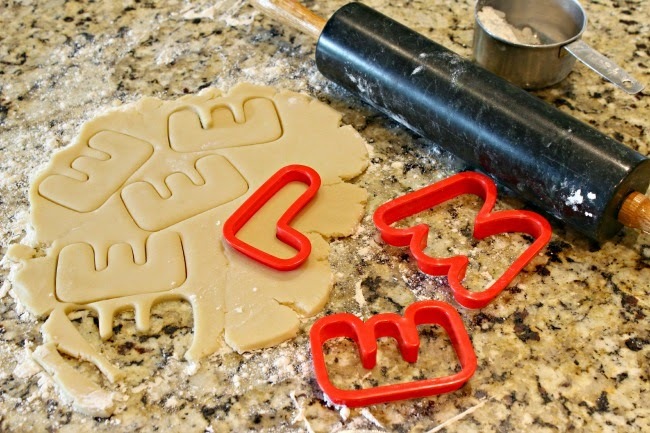 fill each with cream cheese. 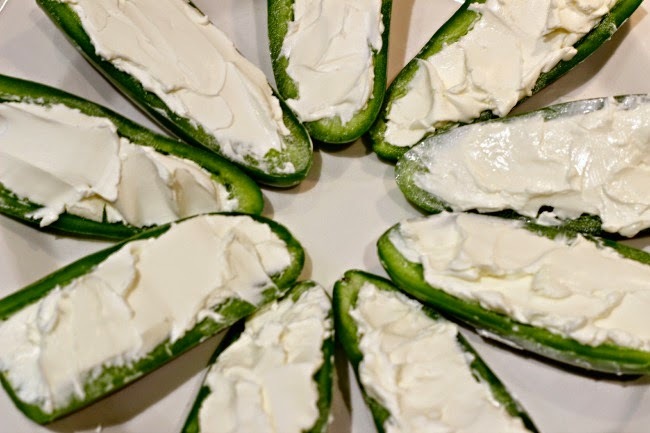 One brick of cream cheese will fill about 8 large peppers (16 halves). 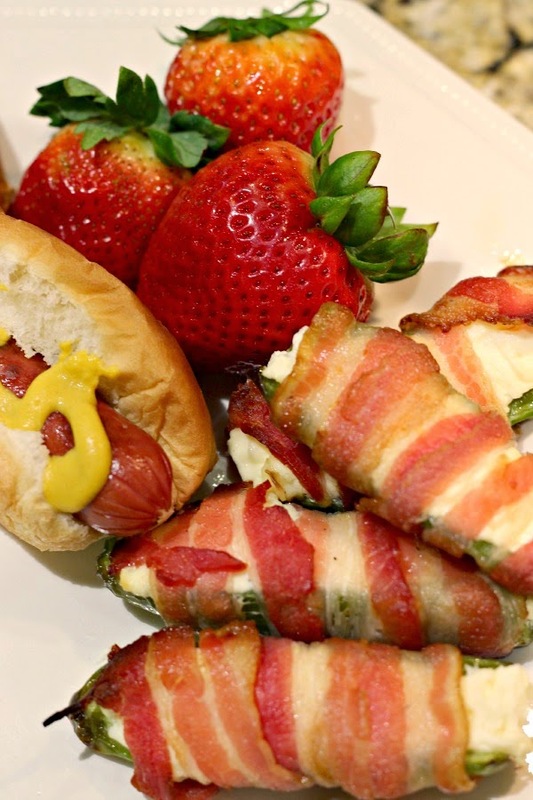 Next, wrap with bacon. Thinner bacon works best here. 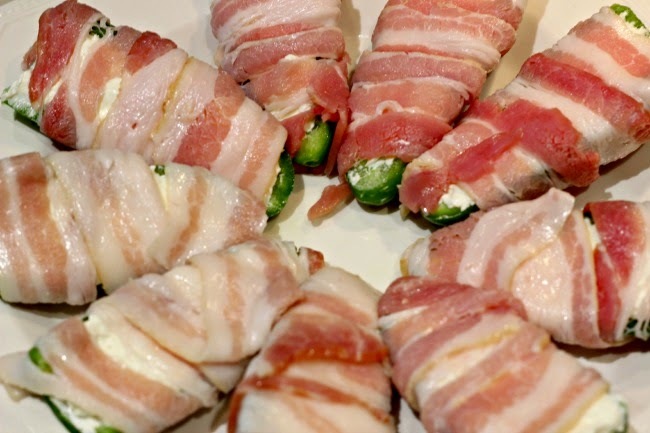 I start on the bottom of the pepper at one end, then wrap down the pepper, slightly stretching the bacon and pulling tight as I wrap. 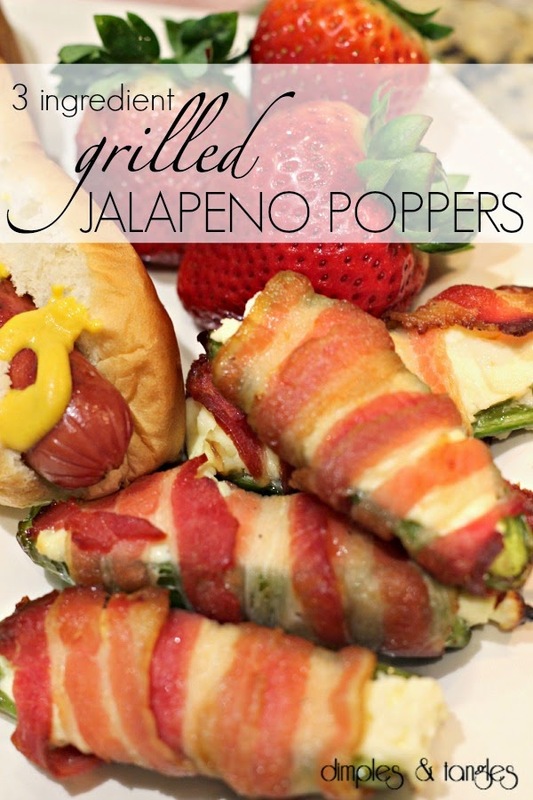 Mine usually stay together well, but you can secure the bacon with a toothpick if needed. To cook, preheat the grill on medium high heat. When ready to cook, turn one side of the grill off and place the peppers on that side (you don't want them directly over the flame). Reduce the heat on the flame side to medium low, close the top, and cook over indirect heat for 30-40 minutes. I like the peppers to be really soft and wilted, but if you want them a little firmer reduce the cooking time a bit. Bacon should be crisp and cooked when cooking time is finished. 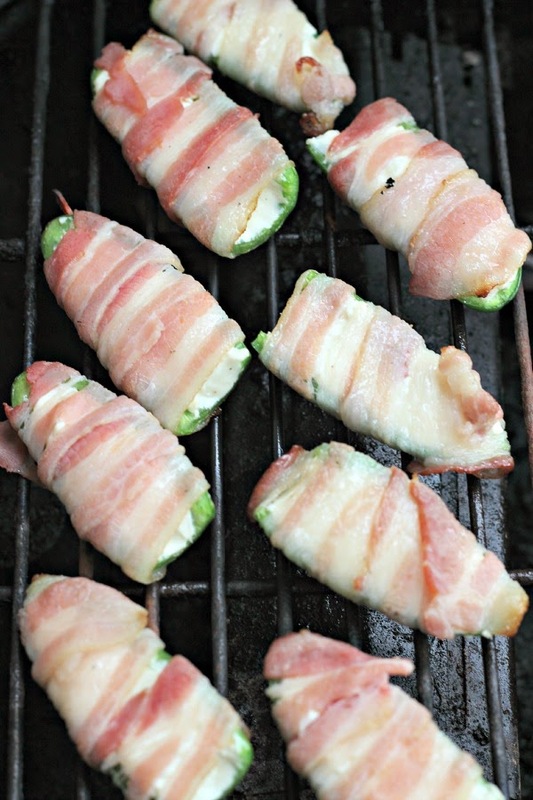 The grill adds such a good flavor to the peppers, but you can also cook them in the oven if needed. You kind find some good tips for oven cooking here. That's it! 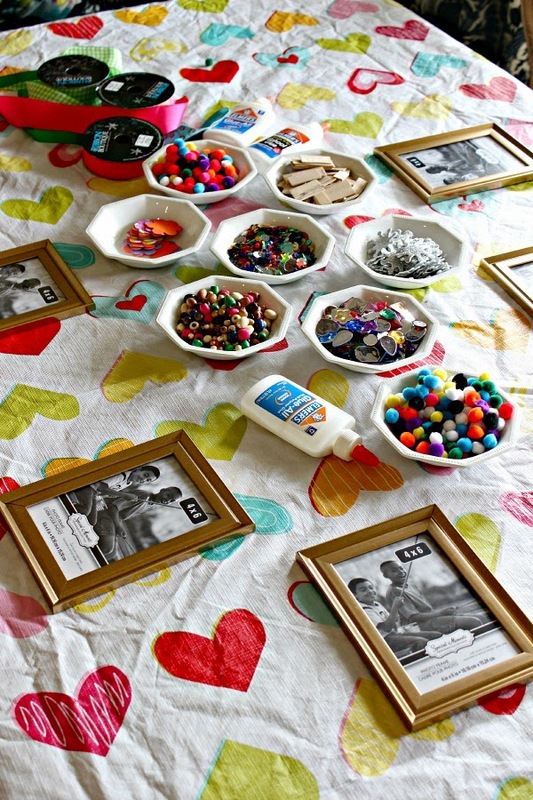 These are super easy, but if you're doing a lot it is a bit time consuming, so plan accordingly. I love to have some leftover, too. I just re-heat them on low in the toaster oven and they're so good. Hope you give them a try this summer! COME WINDOW SHOP WITH ME! While running a few errands this week, so many good things caught my eye! First, have you walked through Hobby Lobby lately? I was there 4,768 times through the 6 weeks of the One Room Challenge, but all of those were quick in and outs to get exactly what I needed. 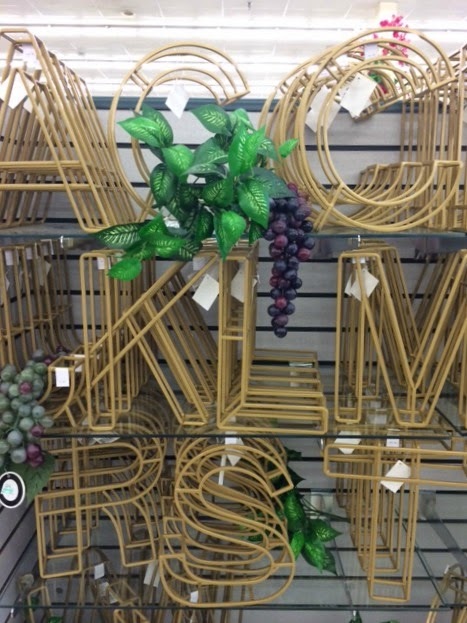 When I had some time to stroll the store this week, I noticed a few amazing things I hadn't seen before. My sister texted this pic to me the other day...way to jump on board the modern train, HL! 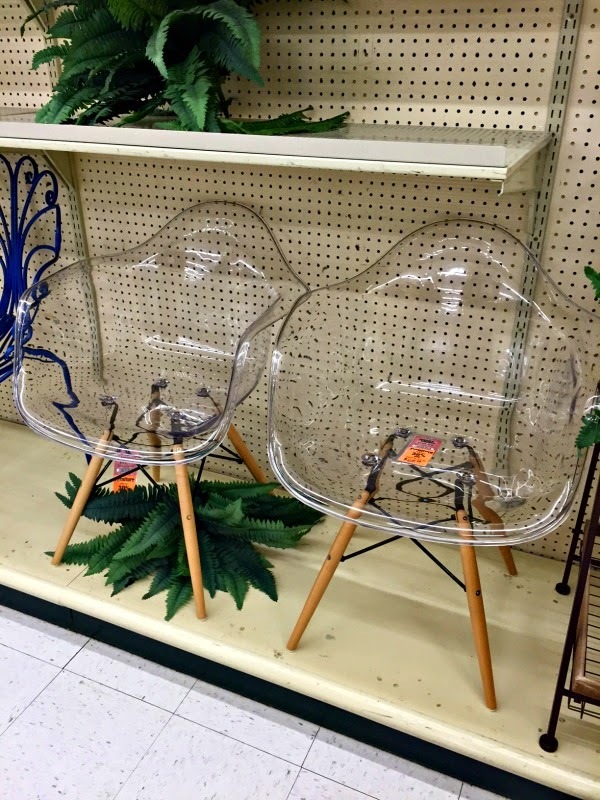 Bethany shared another great new look-alike designer chair here. 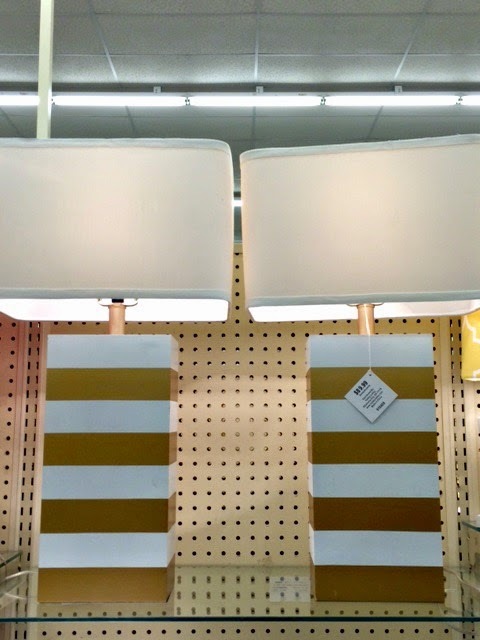 Gold and white striped lamps? Yes, please! 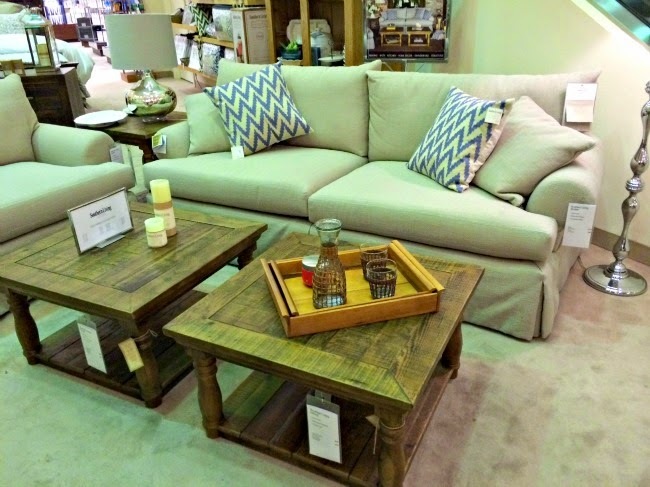 They also have lots of colorful wood and metal side tables right now. I'm in love with this style. These new open frame letters are fun too. 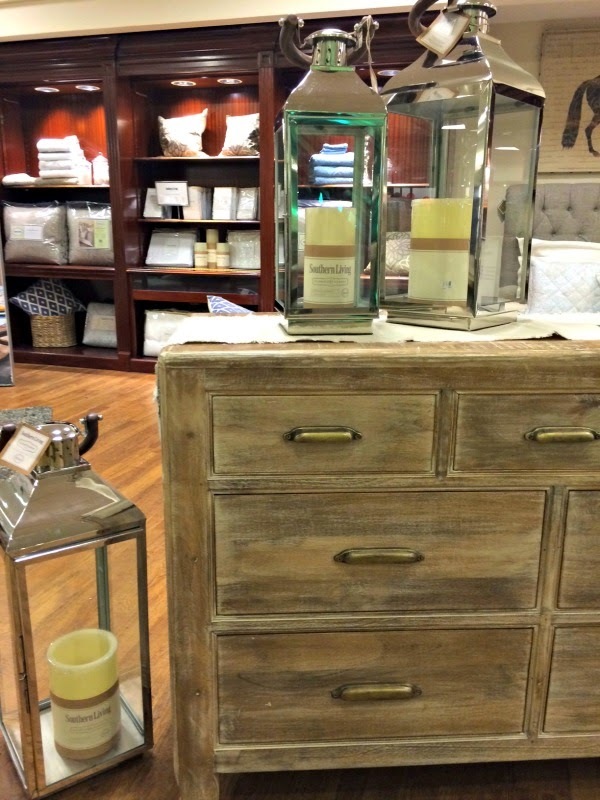 I had to drop my daughter off at the mall for a party this week, and we walked through Dillard's on the way. 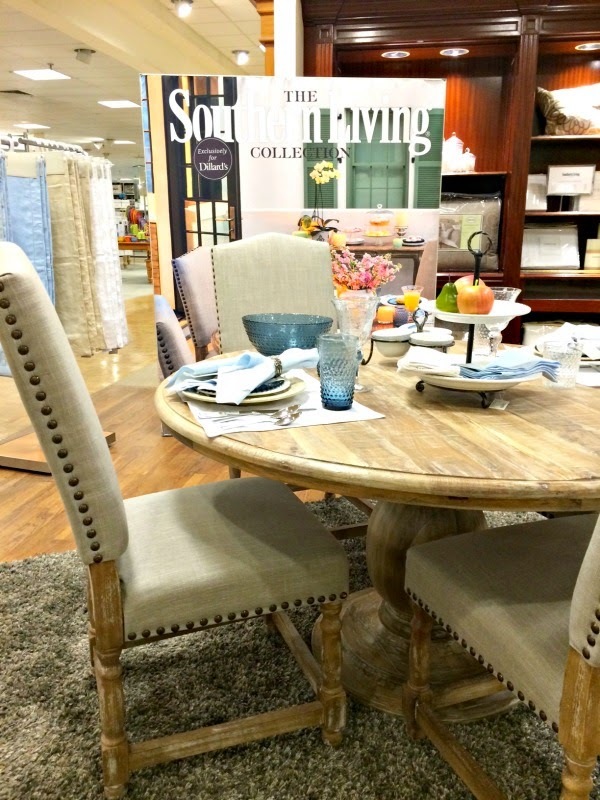 Have you seen their new Southern Living furniture collection? 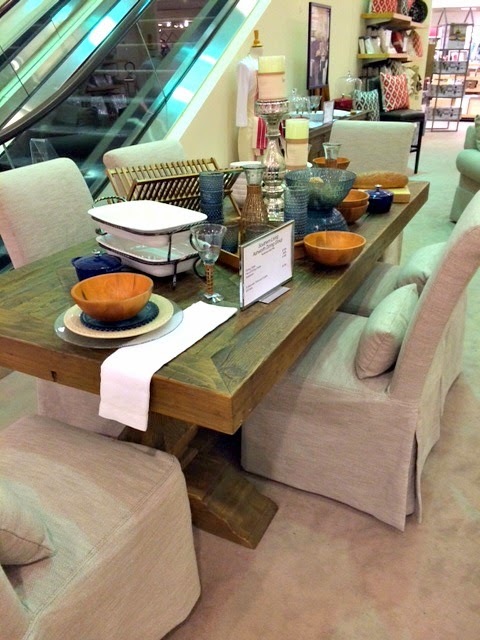 It's full of classic, comfortable pieces, with good combos of rustic and refined. 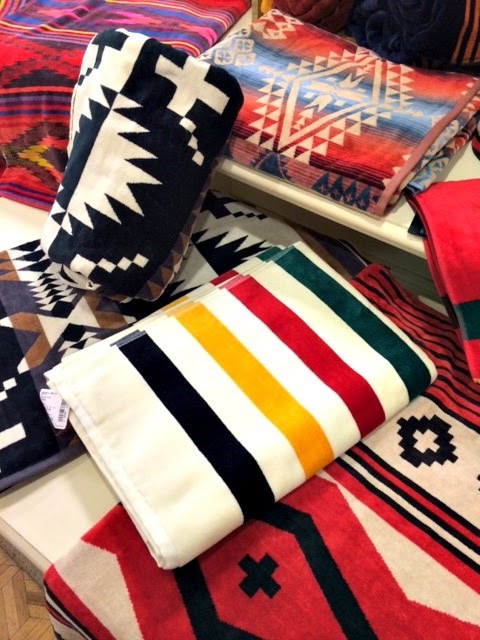 OK, I've wanted a Pendleton camp stripe blanket for like ever. Aren't they cute? But wait... these are all TOWELS! 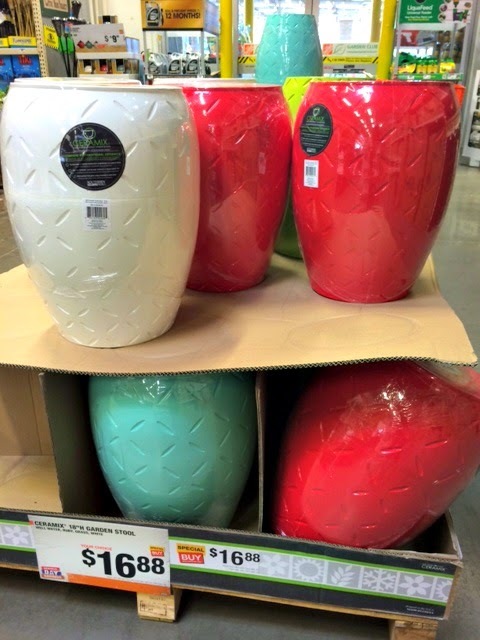 They are a very generous size, how stylish would these be for the beach or pool? 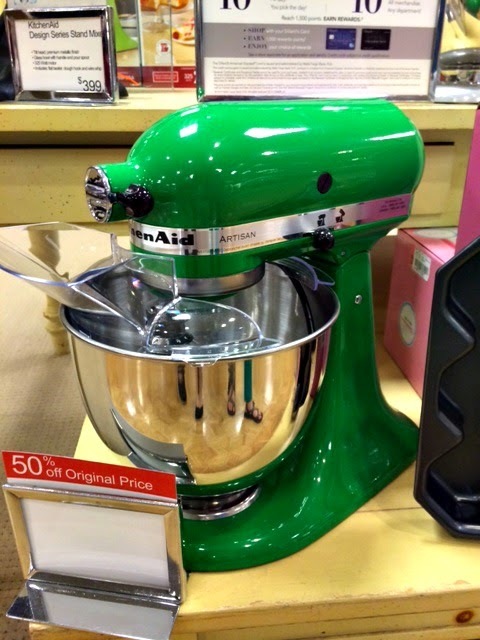 If anyone loved my green mixer as much as I do, it's 50% off right now (which makes it $179). And, I have a feeling extra-off clearance days might be next week, so that would make it at least $50 cheaper! 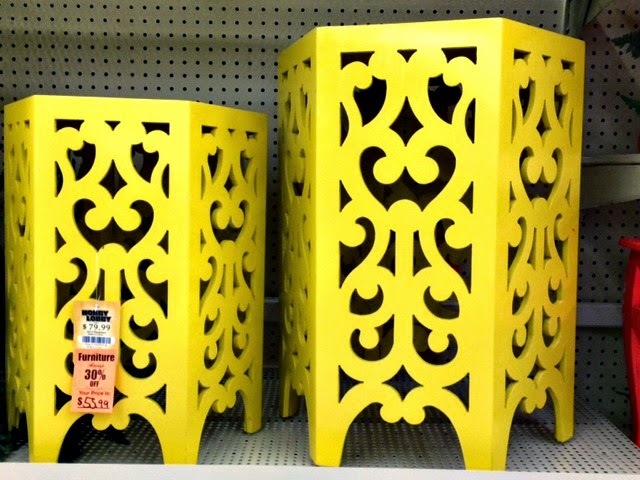 Lastly, Home Depot has these cute garden stools on sale this holiday weekend. I'm pretty sure that price can't be beat anywhere. Speaking of holiday weekends, I hope you have a relaxing, full of fun, fantastic one! 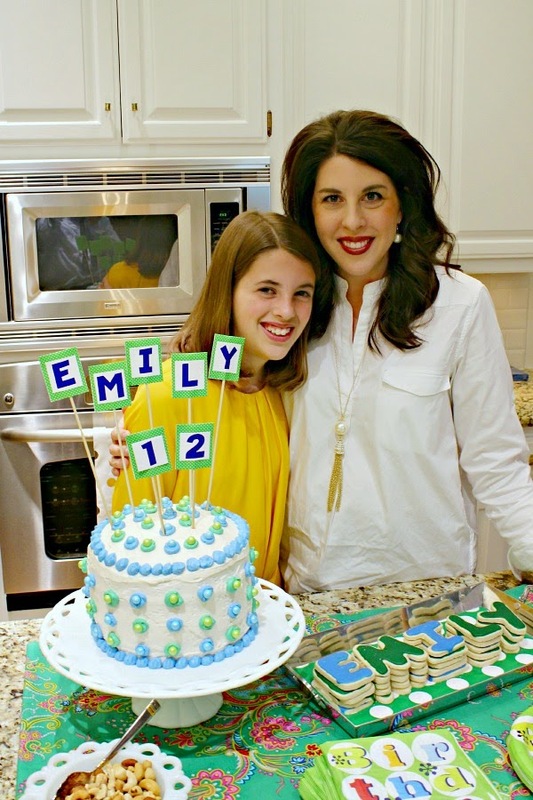 EMILY'S 12TH BIRTHDAY PARTY, COOKIES, CAKES, AND CRAFTS! Although my daughter's birthday was a few weeks ago, we were finally able to celebrate over the weekend. It was a two-part affair, made up of a sleepover with a few friends one night and family get-together the next night. 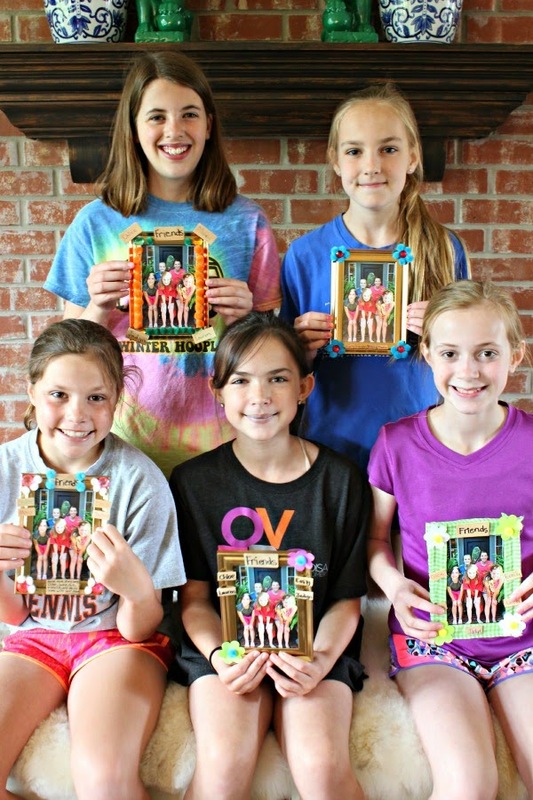 For the sleepover, we kept things super simple and unstructured. 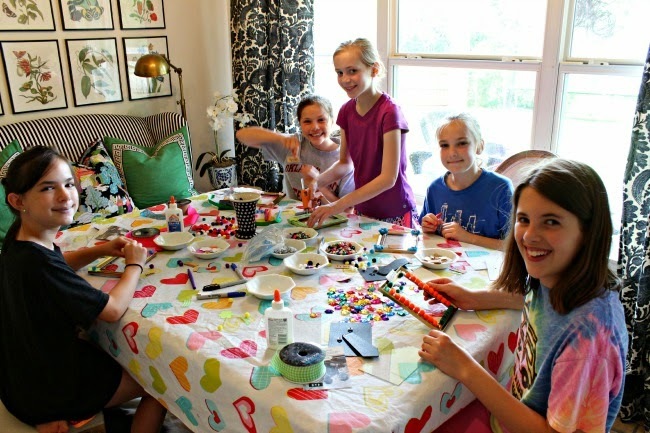 I didn't plan a lot of activities, and the girls really enjoyed just hanging out! 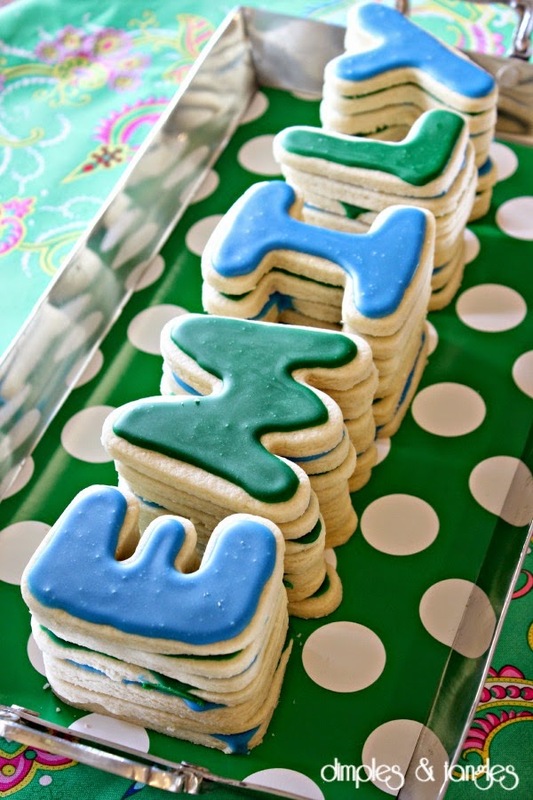 Since I was saving her cake for the family party, I made a fun cookie "cake" for her friends with simple sugar cookie dough, the alphabet cookie cutters that we used to use for play-doh, and icing. Once the icing hardened over night, I was able to stack the cookies on a tray for a cute presentation. 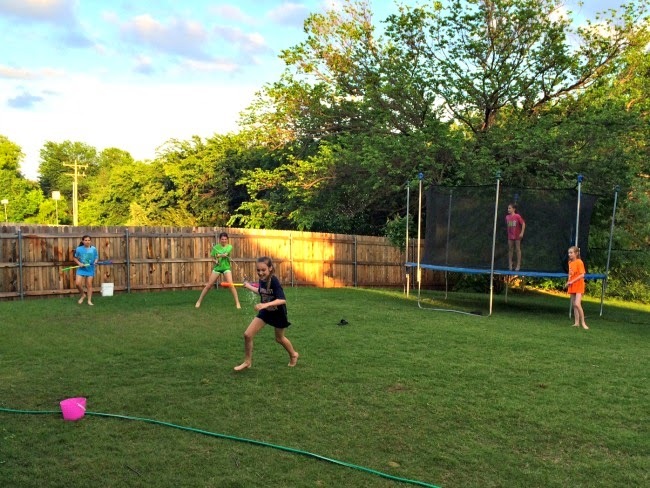 Just for fun, I picked up some water shooters at Dollar Tree, and they had a blast filling them from buckets in the back yard and squirting each other. I also got some glow necklaces and bracelets that made a late-night movie a bit more festive. and let them have free reign decorating them. The night before I had taken their picture all together and had it printed at the 1-hour photo shop, so when they finished their decorating, we popped the photo in and they had a sweet favor to take home. I always make my kids' cakes, and while they are nowhere near perfect, we always have fun coming up with different designs, usually centered around their interests at the time of their birthday (previous girl's cakes here and here, and boy's cakes here and here). 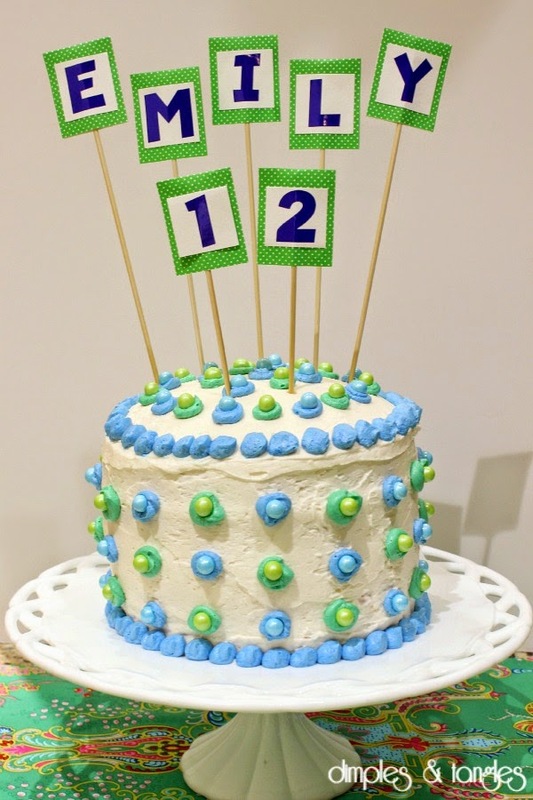 This year my daughter turned 12, and we didn't come up with a themed cake, but ended up decorating with her favorite colors. I stumbled across color coated Sixlets in the cake decorating section at Wal-mart and thought they would be a cute accent. I used this recipe for the frosting this time, and it was delicious! The cake itself is a 4 layer made in 8" pans, and they always want the box funfetti mix... easy enough! For an easy topper, I used some scrap paper, letter stickers, and wooden skewers.